Conroy was the son of John Ponsonby Conroy, a barrister of Bettyfield in County Roscommon, and his wife, Margaret, daughter of Francis Vernon Wilson of Tully in County Longford. Conroy was privately educated in Dublin. In 1803, he was commissioned as a Second Lieutenant in the Royal Artillery and was soon promoted to First Lieutenant. Two years later, he enrolled in the Royal Military Academy at Woolwich. His career spanned the Napoleonic Wars, but he did not participate in the Peninsular War or the Waterloo Campaign, and lack of battle experience drew the derision of some of the other officers. He was, however, able to advance to Second Captain (1811) and adjutant in the Corps of Artillery Drivers (1817), due his marital connections. For, on 26th December 1808, he had wed Elizabeth, the daughter of Colonel (later Major-General) Benjamin Fisher and, thereafter, served his father-in-law in a number of administrative positions in the UK. In 1817, Conroy was appointed equerry to Prince Edward, Duke of Kent and Strathearn, the fourth son of George III, after having been brought to his attention by his wife’s uncle. The following year, the Duke married Princess Victoria of Saxe-Coburg-Saalfeld and their only child, Princess Alexandrina Victoria of Kent (later Queen Victoria) was born the next year. After the Duke’s death in 1820, Conroy offered his services to the widowed Duchess who appointed him controller of her household. He retired from the Army on half-pay two years later. The two became very close in the hostile environment that surrounded them. Together they set up an elaborate and oppressive system of rules regulating every aspect of young Princess Victoria's life, called the ‘Kensington System’ after the palace where they lived. Conroy bullied and insulted the girl and she grew to hate him. The idea was to make Victoria completely reliant on the two of the conspirators by keeping her in reclusive isolation, even from her extended family. When she became an under-age Queen, her mother would be rule as Regent and Conroy would pocket a peerage and a plumb job as her private secretary. To this end, Conroy promoted the Duchess as respectable and modest in stark contrast to the unpopular extravagance of George IV. He also became close to the King’s impressionable and unstable sister, Princess Sophia, using her as a unwitting spy at Court while taking control of her finances to great personal benefit. In 1827, the Duke of York died and Victoria became second-in-line to the throne. Conroy then persuaded the King that the Princess should not be surrounded by commoners and, despite he and the Duchess being unpopular with the Royals, he made a knight commander of the Hanoverian Order. Two years later, the Duke of Cumberland spread rumours that the two were lovers, while the Duke of Clarence publicly referred to Conroy as ‘King John,’ and his wife wrote to the Duchess of Kent warning her of allowing Conroy too much influence; but by the time Clarence became King William IV in 1830, Conroy was very confident in his position. The new king tried to gain custody of his niece, the heir to the Throne, but Conroy insisted that mother and daughter could not be separated and embarked on a promotional Royal tour of the country. This resulted in the Duchess being declared regent-in-waiting, despite King William’s hatred of her. As Victoria grew older though, a regency became increasingly unlikely, so Conroy promoted the idea that the Princess was "weak-minded, frivolous and foolish" in need of constant guidance, and even tried to have her sign away her future private secretarialship to him when she was ill. Upon eighteen-year-old Queen Victoria's ascension to the throne in 1837, Conroy was banished from Court. However, the Prime Minister, Lord Melbourne, was obliged to agree to a number of his demands – including a baronetcy and a £3,000 pa pension – just to avoid any scandal. Conroy remained part of her mother’s household for a while, but Victoria relegated them to remote apartments in Buckingham Palace. 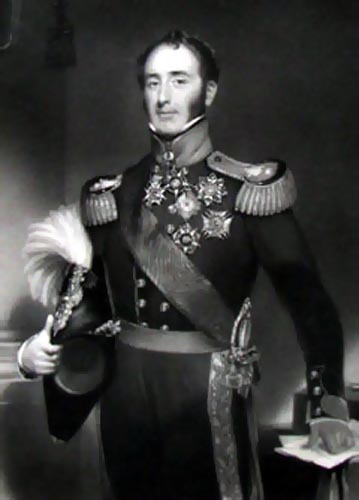 After two years, the Duke of Wellington did finally convince him to leave and he took his family of three sons and two daughters to the Continent in an effective exile. By 1842, Conroy had settled at his country seat, Arborfield Hall in Berkshire and became a gentleman farmer, winning prizes for his pig breeding. His lifestyle, and indeed the purchase of the house, were apparently funded by Princess Sophia who did not die until 1848; but, despite his pensions and properties, including lead mines in Wales, Conroy was in substantial debt when he too died six years later. After his death, the Duchess of Kent acknowledged that Conroy had swindled her out of huge amounts of money – including gifts of £60,000 from her brother and the King – while almost irreparably damaging her relationship with her daughter. His eldest son, Sir Edward, succeeded him to the baronetcy, but had to sell the Hall in favour of an adjoining estate with a smaller house, Arborfield Grange.